I recently read this account of a woman’s experience with Elder Neal A. Maxwell, formerly of the Quorum of the Twelve Apostles of the Church of Jesus Christ of Latter-day Saints. 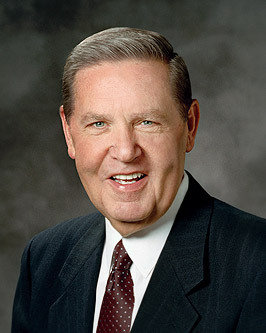 For those who aren’t members of the LDS Church, the Quorum of the Twelve Apostles is the second-highest governing council of the Church, roughly equivalent to a Cardinal in the Catholic Church, although in some senses higher because there are fewer Apostles than there are Cardinals, and also because Apostles aren’t assigned to a specific geography, but rather the entire global Church. In short, within Mormonism, they’re a big deal. They, along with three other men in the First Presidency, lead the entire Church, and are believed by Mormons to be Apostles of Jesus Christ, in exactly the same way that Peter, James and John of old were. Because leading the Church is in many ways like leading a large corporation or a small country, they are incredibly busy. So now my story. When I was in college I made the (terrible) decision to spend the summer selling pest control door-to-door in San Jose, CA for – and I’m not making this up – Pied Piper Pest Control. That experience was every bit as miserable is you’d imagine it to be. I lived in an unfurnished apartment with a few of my close friends. After a hard, hot day of getting doors slammed in our faces, we’d gather in our apartment and sit on the living room floor (again, the apartment was unfurnished). This was back in the days before cell phones were widely used, and so I would occasionally call the voice mailbox of our apartment phone back in Provo to see if anyone had left messages for any of us. I’m not sure who I was hoping to hear from; probably someone who could offer me a job that didn’t require me to wear a polo shirt with a picture of the Pied Piper on it. One night as I called to listen for messages I was informed that there was a new message waiting and I hit the button to listen to it. The message was, confusingly, not for me or any of my roommates, but rather for a woman whose name I can’t remember. Even more confusingly, it was from Elder Jeffrey R. Holland of the Quorum of the Twelve Apostles. The gist of the message was that Elder Holland had attended a high school class reunion and noticed that this woman was missing; he had inquired around as to why she was absent, and was told she was suffering from a serious illness. And so he was calling to wish her well and see if he could do anything for her. I got the sense from the message that Elder Holland had not had contact with this woman for quite some time, even perhaps since high school. He went on for a few minutes recounting some funny stories of the reunion, and then told her, as I recall, that he loved her and that God loved her and to call him if he could do anything for her. Confused and intrigued, I listened to this message several times over, and then hung up. I called the voice mailbox again, and this time received my messages (no non-Pied Piper-polo-related job offers). It seems I had simply entered the wrong code and been given access to this woman’s messages. So, what is my point? We can argue about Mormon doctrine and history, and reasonable minds can arrive at different conclusions as to the truth claims of the Mormon church. And certainly, Mormon leaders are far from perfect; some will no doubt have had personal experiences to that effect. But I know from first-hand personal experiences like this one and others that the men who lead the Mormon Church are men who are, at the very least, doing their best to follow the example of Jesus both in public and private.